Think the festival season is definitely over? Guess again. 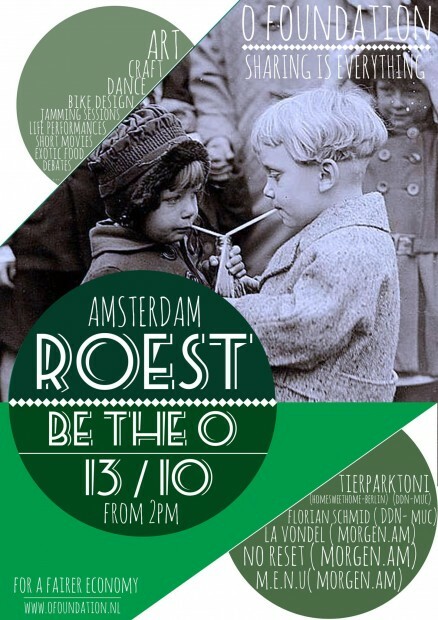 We already wrote about the Valhalla indoor festival, and this Saturday the ‘Be the O’ event will take place at one of the greatest hangouts in the city: Amsterdam Roest. Don’t let the syllable distract you, behind this shiny autumn special stands the O Foundation; a bunch of young and idealistic (yes, they still exist) people who don’t just want some world peace, but change our ideas about helping each other out by creating a network of young ones with this new awareness and set up small projects in third world countries. To promote this new type of fundraising –the ‘O’ stands for the thoughtful network– this Saturday afternoon and evening you can relive your favourite days of the summer once again. Of course there will be live music, live dance performances and live jamming, but I’m especially curious about the ‘live body-painting’ and ‘live painting debating’. You can buy some food, vintage jackets or jewellery, and if you’re down with some introspection you can even join a meditation workshop. When the sun sets and Roest lights their campfires, DJs like La Vondèl and M.E.N.U will tune up the night until 3pm. And it gets better! Imagine you’ve listened to nice music all day and night, are inspired by this amazing new concept, bought or painted a t-shirt, donated some money because the entrance is free, and fluently joined the circle, you may have changed the world a bit. Don’t you think?